One of the many challenges of public transit in Silicon Valley is that both offices and homes are spread out over a large area. This makes point-to-point transit available only in a few limited areas. VTA has just launched an innovative program called FLEX to help address this issue. 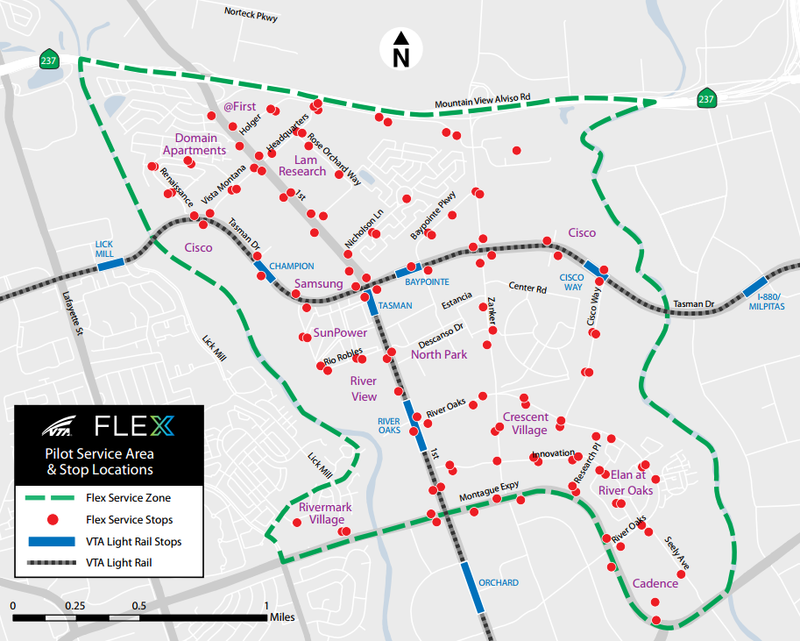 FLEX is an on-demand transit system where you use an app to request a pickup and drop-off in one of many designated service stops in North San Jose. Software will then automatically route vehicles to pick up other customers along a similar traffic route. There are no set schedules, the whole system is on-demand. Payment is even done via the smartphone app. You can think of it as a public version of UBERpool. The vehicles that will be used for FLEX are ADA-accessible buses with capacity for 26 passengers and two bikes. Service is available Monday through Friday from 5:30am to 8:30pm and the cost is only $2 during off-peak times and $3 during peak times. If the program is successful, you can expect other areas to get a similar service in the future. For more information click here. FLEX is an On-Demand, shared-ride public transit service. Other riders that have similar travel destinations may be picked up and dropped off during the course of your ride. FLEX is ideally suited for smartphone users. Riders can use the app to request a ride. Monday – Friday; 5:30 a.m. to 8:30 p.m. Peak Hours 5:30 a.m. – 9:30 a.m.; 3:30 p.m. – 7:30 p.m. The last Flex ride MUST be completed by 8:30 p.m.
Customers who fail to cancel a ride before the bus is dispatched or have failed to show up for their rides will be charged the regular fare. 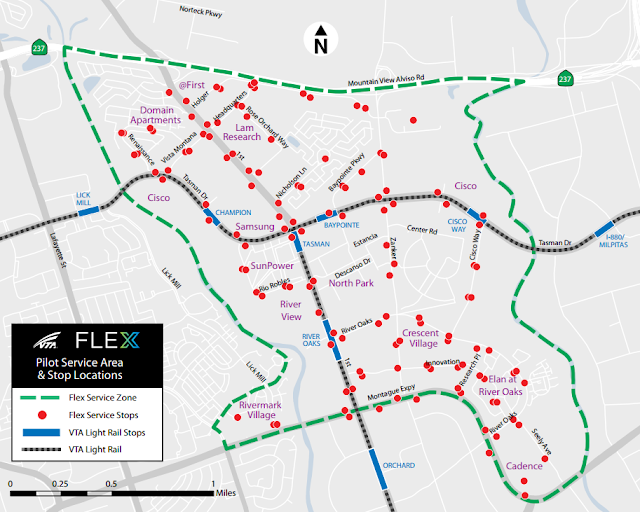 You can download the VTA Flex Fact Sheet here. What VTA fare can I use on FLEX? Currently you must pay for your ride using an account that you set up on the FLEX app. Once you complete your ride on FLEX your account will be charged. FLEX does not accept Clipper cards, VTA Monthly Passes, VTA Day Passes, VTA Express Day Passes, Cash, Eco Pass nor any other VTA forms of fare. How do I know if I’ve been assigned a driver? You will be notified via text message when booking through the app. If booked over the phone, the customer service representative will let you know once you’re assigned a driver and their estimated time of arrival. You can also check out the web or app to see real-time updates about your requested ride. How long does it take for my driver to pick me up? Can I track my driver? It depends on trip requests at any given time. The web and app interface will show you an estimated time of arrival, based on the driver’s GPS location and current trip load. Where will I wait for the FLEX bus? Are there bus stops? X marks the spot! The app will provide you walking directions to the FLEX stop where you will be picked up. The stops are marked with FLEX floor decals. Can I bring an Animal onboard FLEX? Only service animals are welcome on FLEX. The animal must be under the control of the passenger throughout the trip and while boarding and exiting. Service animals may sit on the floor or in the rider’s lap. Service animals may not sit in a passenger seat. Can I contact the driver? No, you cannot contact the driver, but you can determine the driver’s location through the real time mapping on the app. If I cancel my ride request, then make another one, will my request go to the end of the request queue? Yes, every time you cancel and resubmit a request, the process starts all over again. Your request will be put at the end of the queue and then be assigned to the next available driver. I don't have a smart phone, can I create my account online? Yes, you can create your Flex account through the web on this page. *FLEX is a pilot program and the fare structure may change during and/or after this pilot program phase. Please continue to check this page for updates.